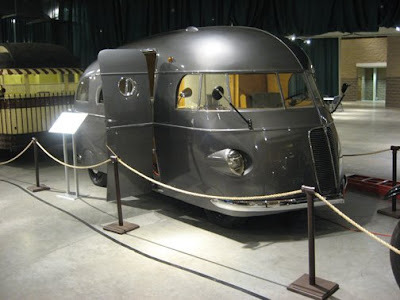 The world's largest covered wagon, although it appears to be more of a convertible here. 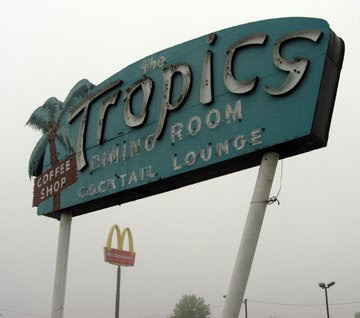 The Tropics appeared to have gone out of business when we were in Lincoln. It wasn't for lack of an extra cool sign, though. You can't have a town named Lincoln in the state of Illinois without a big tribute to Old Abe and Lincoln, Illinois has lulu. 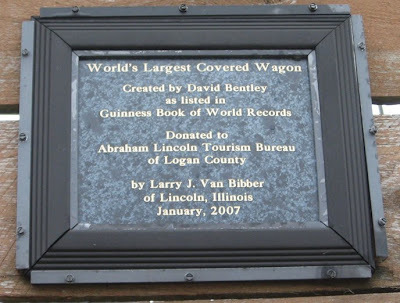 It's the world's largest covered wagon, driven by the railsplitter himself. 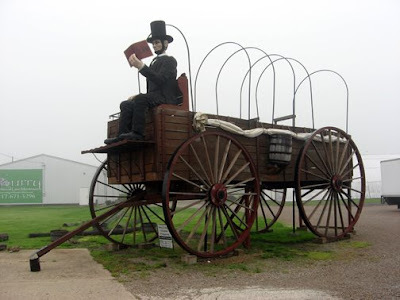 I don't recall if Lincoln ever actually travelling by covered wagon from my high school history classes but what-the-hey, this is pretty awesome. 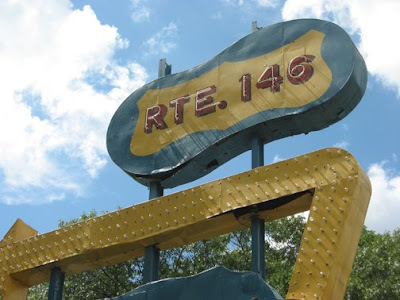 It's also on Route 66 (on the corner of Woodlawn Road), which is nothing but cool, too. We got there early on a foggy morning after spending the night at the Super 8 across the street. Abe is lovingly rendered in a grotesque folk art motif and sits on a prominent plot next door to a lawn mower dealership. The site weighs five tons, is 40 feet long, 12 feet wide and 24 feet tall and is in the Guinness Book of World Records. 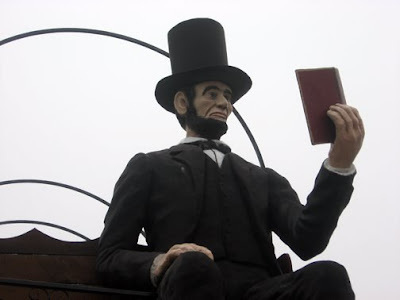 Abe is seen reading a law book, which seems appropriate since he practiced law in this very town. He was obviously ahead of his time in the reading-while-driving department, too. In the same neighborhood were some pretty cool signs too. 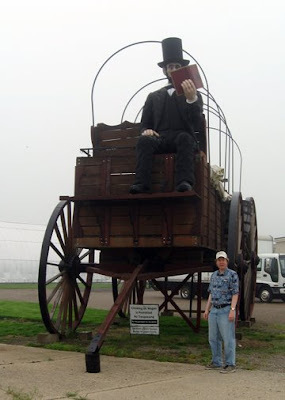 Overall, this is a great eccentric roadside attraction, but know what would have been even cooler? A giant Abe Lincoln driving a giant Lincoln Continental. That would be Abe-ove and beyond, but nobody asked me. 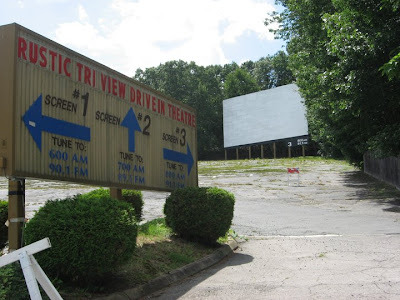 The thriving Rustic Drive-In is across the street. 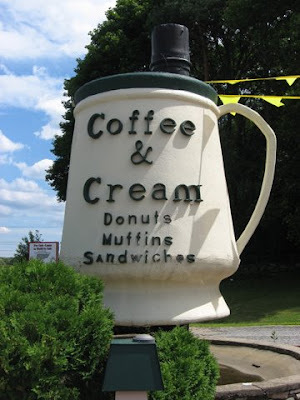 And just down the road is Coffee & Cream, home of the giant travel mug. 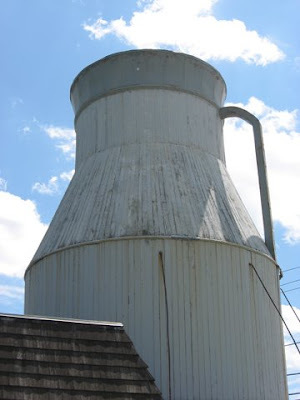 The Milk Can's story is a well-intentioned but sad one. 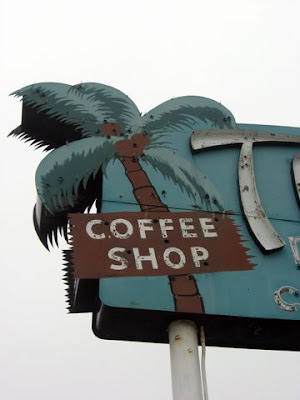 The building dates back to 1929 and is a prime example of that era's buildings-shaped-like-things roadside architecture. 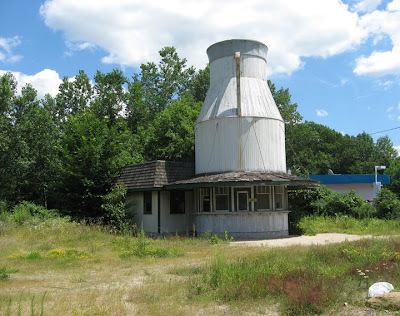 It went out of business in 1968 and sat vacant until the state wanted to use the land it was on for a highway exit ramp in the 1980s. 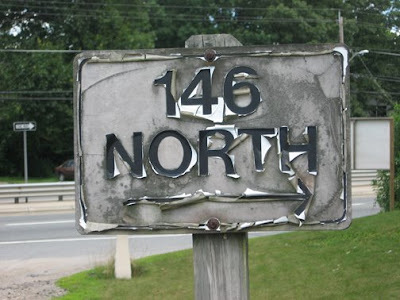 Stanley Surtel Jr. and his father-in-law Frank D'Andrea bought the structure for $1,100 and had it moved from its original Lincoln, Rhode Island location to a new spot a mile down the road on Route 146 in North Smithfield. 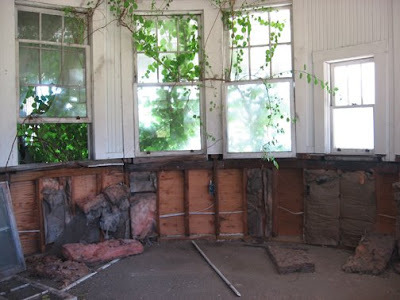 Almost immediately, the new owners encountered problems. 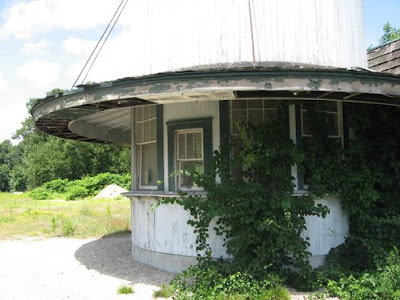 It took preservationists and highway officials 17 months to devise a way to move the building without damaging it. Then regulations for installing a septic system added another delay. 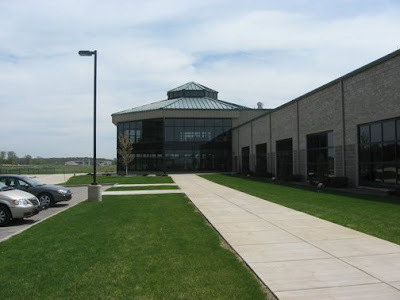 Surtel and D'Andrea put $50,000 into restoration when the state informed them the ground water on the new location was horribly contaminated with 600 times the allowable amount of benzine. Never reopened, the structure has been sitting on that same plot since 1991. As much as I love beautifully restored or original old places, abandoned ones have a special eccentric quality all their own. Poignant, sad, ironic, spooky, or just plain weird... it's all good. 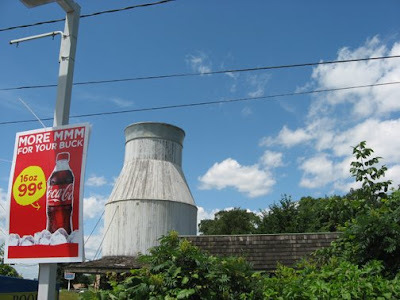 The Milk Can is on a particularly fertile stretch of Route 146. 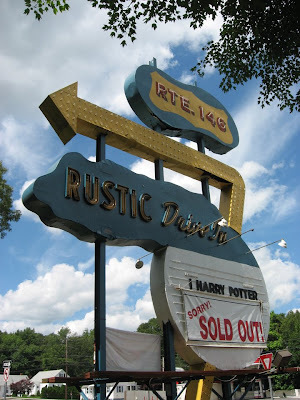 The spectacular Rustic Drive-In is across the street and is the rarest of rare roadside attractions: a thriving drive-in movie theater showing first-run fare like the new Harry Potter movie and selling out. 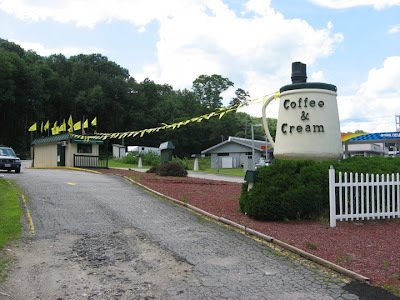 And just down the road, a newer structure, the Coffee and Cream, is a recent establishment with the feel of an old time place but with a contemporary spin: a giant travel mug out front. 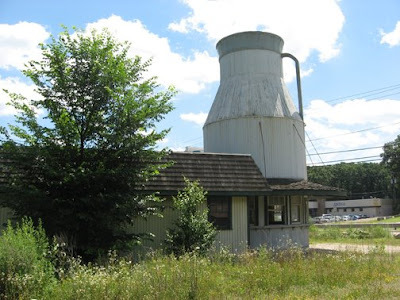 But the Milk Can is the cream of the crop in this trifecta of retro Rhody road sites. 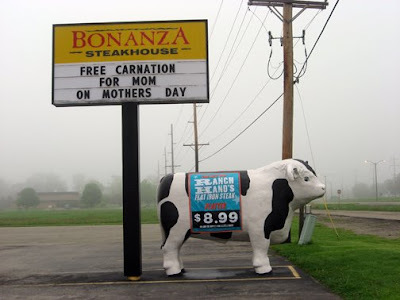 It's an udder delight. 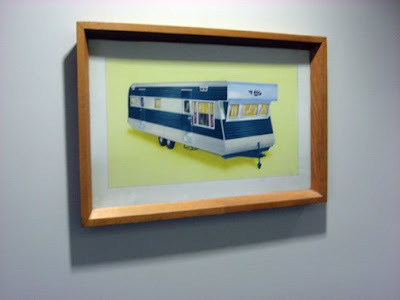 My good pal Bill Murphy reminded me of something about my RV Hall of Fame post that was cosmically coincidental on the 4oth anniversary of the moon landing. 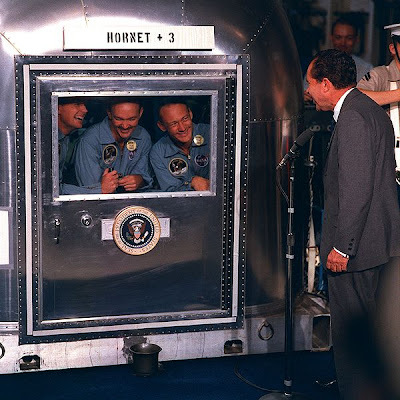 What better place for NASA to quarantine our returning moon heroes than in an actual Airstream trailer? 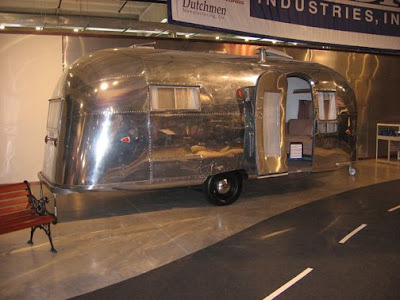 The name is hidden behind the Hornet + 3 sign in the top picture but the second photo clearly shows the proud name Airstream. Kudos, Bill! 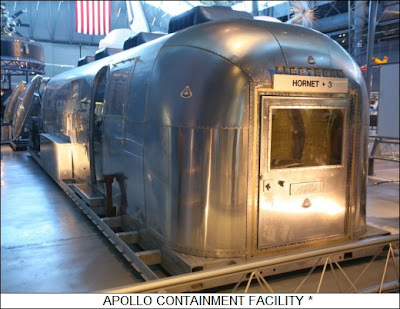 That's one small step for man, one giant shiny trailer for mankind. This is the exterior. A little too tasteful and dignified for my liking. 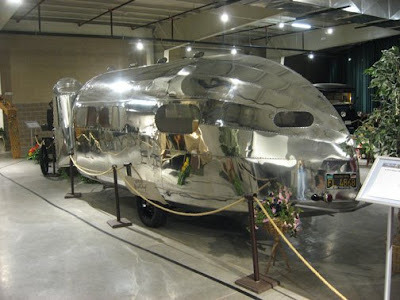 I would have liked to have seen a Zeppelin hangar-sized Airstream trailer, wouldn't you? Elkhart, Indiana is a nice town you're likely to pass by on the Interstate if you're driving to Chicago from the east. 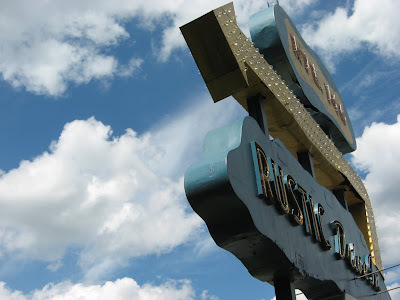 Anyone who has ever played a wind instrument will probably recognize the town's name as the same one engraved in the bell of their Conn trumpet or on the label of their Selmer clarinet. 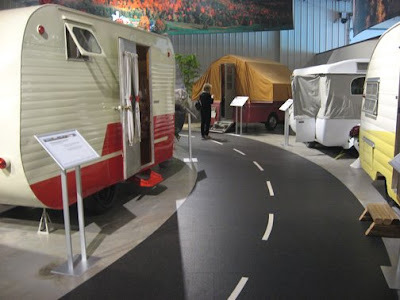 Elkhart also has many recreational vehicle manufacturers and is known as the RV Capital of the World (maybe even the Universe, so take that, Pluto). 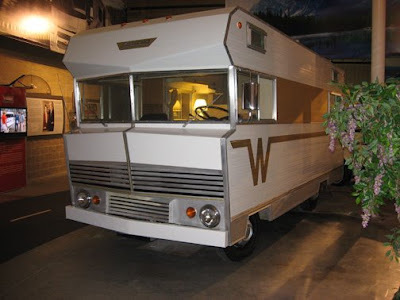 It seems only appropriate, then, that they would be home to the RV Hall of Fame. 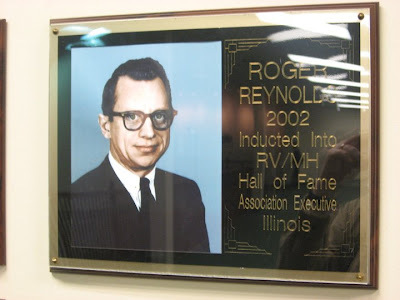 Formerly in smaller quarters downtown, the RVHOF now sits in palatially new digs mere seconds off of Interstate 80. 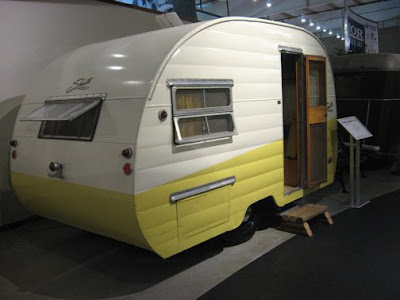 Inside is a dazzling historical array of all things trailer: you've got your Airstreams, you've got your Shastas, and don't even get me started on the Winnebagos. 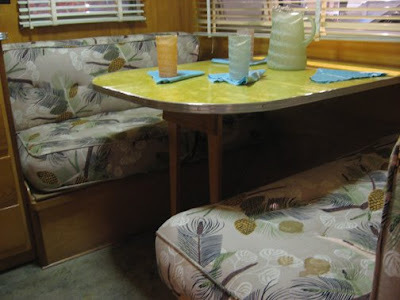 The vintage "cans" are complete with period interiors you can poke your head into to drink up the retro atmosphere. 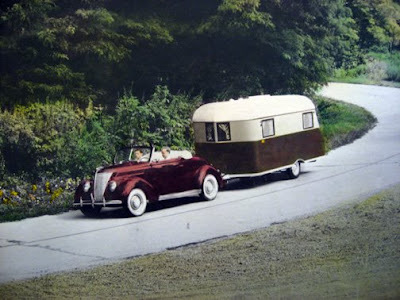 In the very early days of roadside travel, having your own hard-shelled home on wheels to dryly bed down in must have seemed like the lap of luxury, and this still holds true with today's astounding variety of RVs currently on the road. And there really is a Hall with lots of Fame in it. 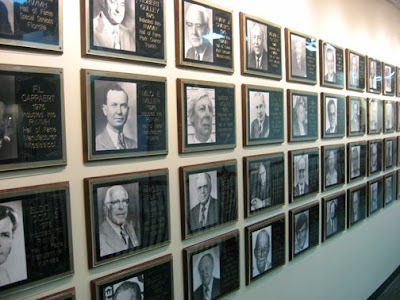 Scores of framed pictures of those with the right stuff to be so honored by such a prestigious organization line the walls. This place is terrific for roadside fans looking to take a little break while travelling cross-country and should not be missed. 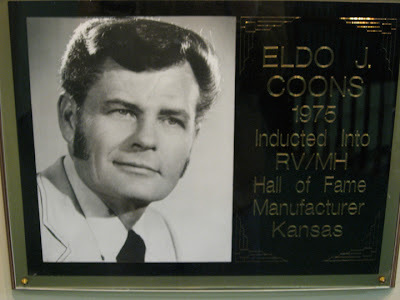 My one regret is that because the RVHOF is so close to the highway, you don't get into the town of Elkhart for a looksee. 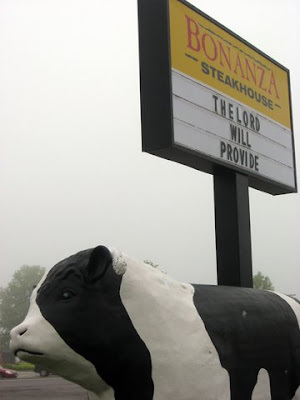 I hear they have a nice muffler man there. Cheshire, Connecticut is a lovely little community two towns north of New Haven with nice homes, well-maintained businesses, and a lot going for it. It's also the friendly neighbor of my hometown, Hamden. 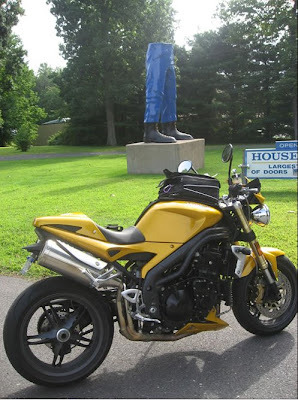 So imagine my surprise when I found out there's been a Muffler Man residing there since the 1980s. Who knew? We just had to check it out on our last visit to Mom's house. 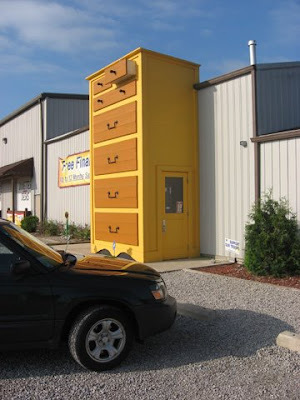 It sits in front of a business called House of Doors and it's in spectacular condition. This wasn't always the case, however. For some time, just his legs were perched on the concrete block on the front lawn. 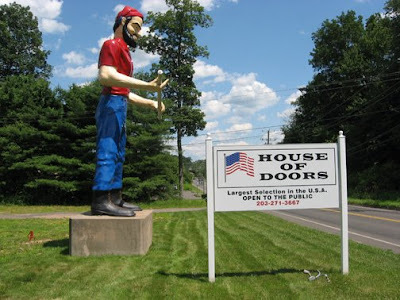 Fans feared for his future, but the good folks who owned him were giving him some tender loving care, and now he stands proudly to greet the throngs of door shoppers looking for the largest selection of doors in the USA if you believe their sign and we have no reason not to. There's another funny story attached to this site. 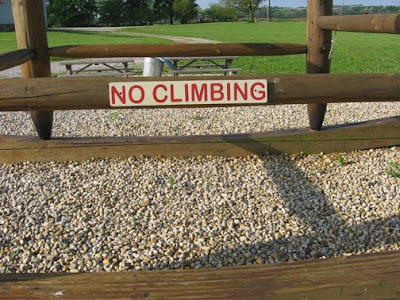 Cheshire, being the quaint, tasteful, moneyed New England community that it is, has an ordinance that prevents no sign from being more than seven feet high. 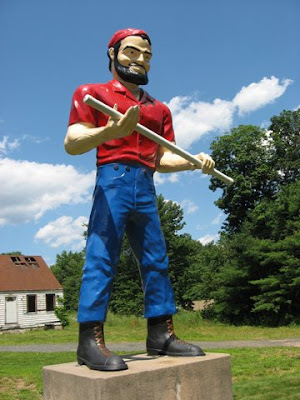 According to roadsideamerica.com, when the lumber business that is now the House of Doors put a 26-foot-tall Paul Bunyan muffler man on their front lawn in the early 1980s the town was up in arms, so the Sirois brothers who own the business replaced the axe with an American flag. "You can build a flagpole as high as you want and the town can't do anything about it," they told us. 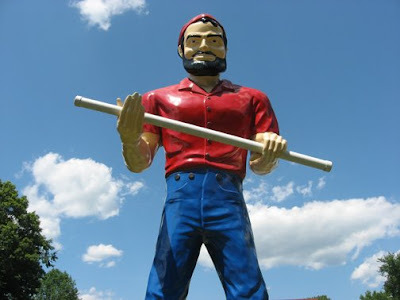 The muffler man, they proudly claim, is now "an official landmark." No flag was present when we viewed him a couple of weeks ago, so either the House of Doors is brazenly flaunting the law or Cheshire has lightened up and learned to love this outstanding specimen of Muffler Manhood. 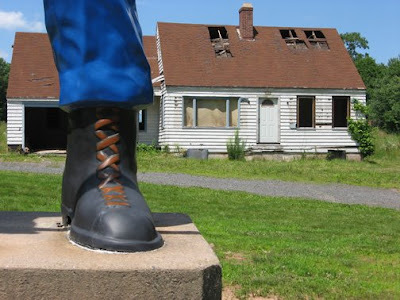 It seems peculiar, though, that he is in much better condition than the dilapidated house he stands watch over. We took a pleasant detour off the Interstate between Indianapolis and Louisville into the pretty little community of Franklin, Indiana. Just south of there is the even smaller village of Amity and, although it's a dinky town, they do have a very big thing to offer. Two big things in fact. 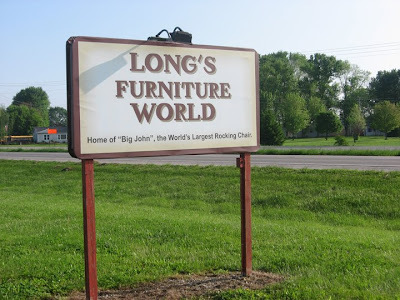 Long's Furniture World is home to Big John, the world's largest rocking chair. 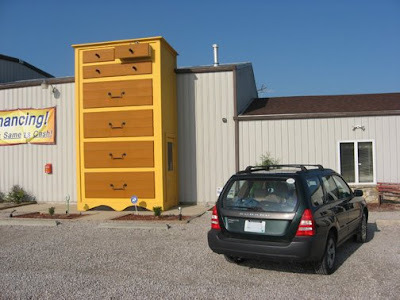 They also have a very large chest of drawers that serves as their front entrance. 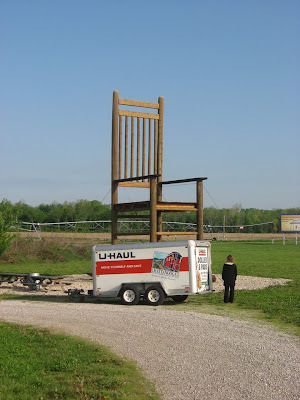 Let's see... a big chest and a big seat. I know there's a crude master-of-ceremonies-at-a-bachelor-party joke in there somewhere. 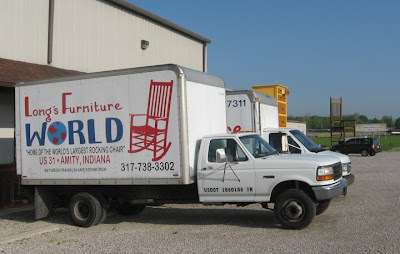 As is often the case with declaring your whatever-it-is the "world's largest," this example is not without controversy. Fanning U.S. 66 Outpost & General Store in the Route 66 town of Fanning, Mo., installed a 42-foot-tall rocking chair in 2008. 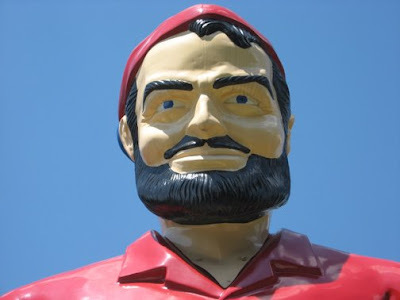 This surpasses Big John by probably 10 feet (I can't seem to find any Big John stats online). 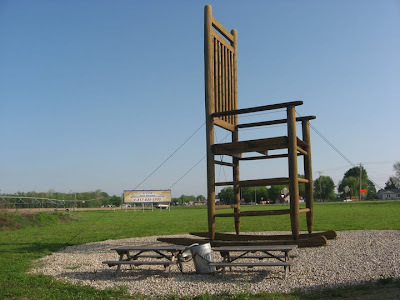 But we won't quibble...Big John is the largest chair we've ever seen, and it's especially stark against the flat Indiana farm landscape. We love places like this that get you miles off the highway to see the real America in all its eccentric banality and splendor. Keep on rockin' in the free world, Amity!